Showing 40 articles from October 2, 2013. RALEIGH — Franklin County animal welfare staff plans to fight a state decision to enforce a fine and close the county’s animal shelter. Last week, the N.C. Department of Agriculture and Community Services’ Veterinary Division notified Animal Control Director Taylor Bartholomew and Franklin County that it has assessed a $5,000 civil penalty against the shelter and suspended its registration — which, without appeal, would close its doors. LOUISBURG — The Franklin County Sheriff’s Office has called off an active manhunt, but they continue to look for suspects in a series of break-ins — one of which prompted a homeowner to fire shots at a suspect. The homeowner, investigators said, suffered a few bruises in the altercation. The suspect was not believed to have been hit by gunfire. 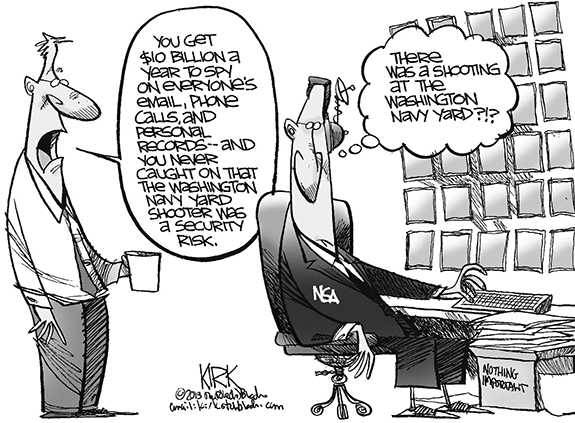 “You’ve got a right to protect yourself if you fear for your life,” said Capt. E.H. Smith. The Youngsville Fall Festival drew hundreds to the town, for arts and craft and food vendors, as well as the annual car show. 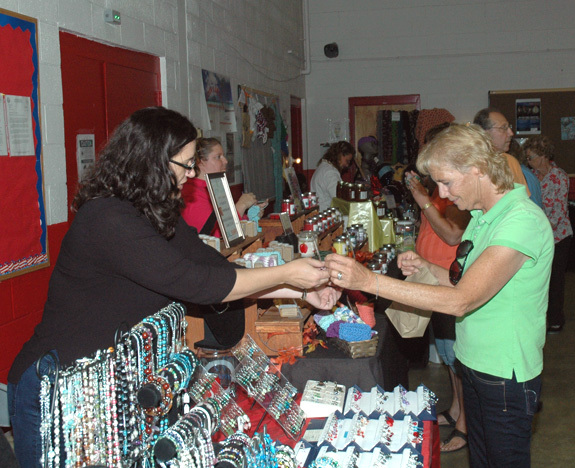 Above, Franklinton resident Lisa Wright, right, looks over some jewelry at Amanda Paige’s Atta Girl booth set up in the National Guard Armory this past Saturday. See more photos in a later edition of The Franklin Times. LOUISBURG — Parties laying claim to half an inheritance intended to benefit animal welfare reached an agreement to split the benefit. The settlement was reached after Ann Lancaster’s sole heir — a brother — decided to step in. 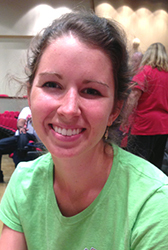 When Lancaster died in December, she left behind an estate — estimated at just under half a million dollars — to be split between Trinity United Methodist Church and the Franklin County Animal Society. LOUISBURG — A jury ordered a Franklinton man to pay a couple $9 million for disrupting their lives through erroneous eviction efforts that splintered their marriage and caused mental instability. The question now is whether Jeffrey L. Witherspoon will be able to pay up. “I don’t have counsel in this case because I couldn’t afford it,” Witherspoon told a jury as he represented himself in a trial that lasted a week, bleeding over into Monday — causing the case to move over to the more compact, small claims court. It’s said that the Mayans predicted that the end of the world as we know it would come with the earth entrapped in a web! As one who has a love/hate relationship with all things computerized, I figured the “web” that would spell doom for us mere humans would be the World Wide Web we created and have become ensnared in. However, recently I’ve begun having doubts. Okay, it’s October, 2013, and despite fierce opposition from the nation’s conservative Republicans, the Affordable Care Act, also called Obamacare, is beginning. That’s in spite of GOP last-ditch efforts to delay its start by reducing funding, an ill-fated move that effectively shut down much of the federal government Monday night. Back in February, I wrote a column about impending sequestration — which would have cut the budget by $85 billion and sent this country into disarray. The government’s response was to kick the bucket down the road to Sept. 30 where “future” Congress would have to deal with the fallout. Guess what? 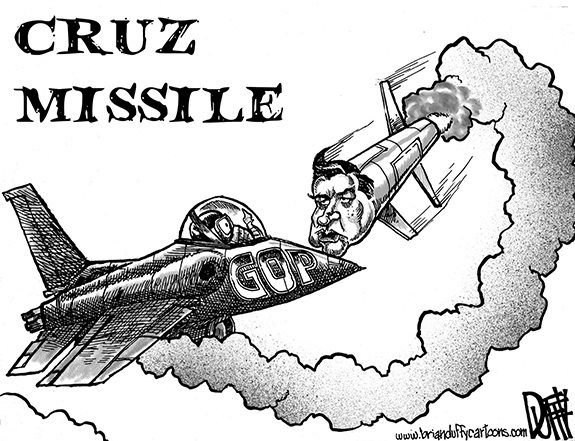 Sept. 30 came and went and, now, we’re in trouble. Does NC’s new voting law justify its billing? Those are the first two dozen words of HB 589, North Carolina’s new voter suppression law. Sounds good, let’s see if it lives up to its billing. In response to Larry Marciniak’s “Telling the Truth” column on Sept 26, headlined “Okay, but what about the rest of the Constitution?” On a day in which, a group of Franklin County residents came together to remember our history and honor the men and women who died to preserve our liberty and freedom, Marciniak attacks in an attempt to divide We The People. LOUISBURG – Catherine Hill Collie, 90, died Wednesday, Oct. 2, 2013 at her home. A graveside service will be held 11 a.m. Friday at Cypress Chapel Baptist Church Cemetery with the Reverend Bill Wallace officiating. Forrest Edwin Bowers peacefully entered Heaven on Wednesday, October 2, 2013 from the Louisburg Nursing Center. “Buck” was born on July 8, 1924 in Morganton, N.C. to Arthur Carlson Bowers and Minnie Mae Phillips Bowers. He was preceded in death by his parents; his sister, Margaret Bowers; and his brothers, James and Phillip Bowers. He was 89 years old. HENDERSON GETS HELD UP. Franklinton’s Derryan Henderson (with ball) tries to avoid a Granville Central tackle attempt during last Friday’s non-conference football matchup. And FHS’ return home would be a happy one as the Red Rams remained undefeated overall with a 36-22 decision over Granville Central last Friday night. WAITING GAME. 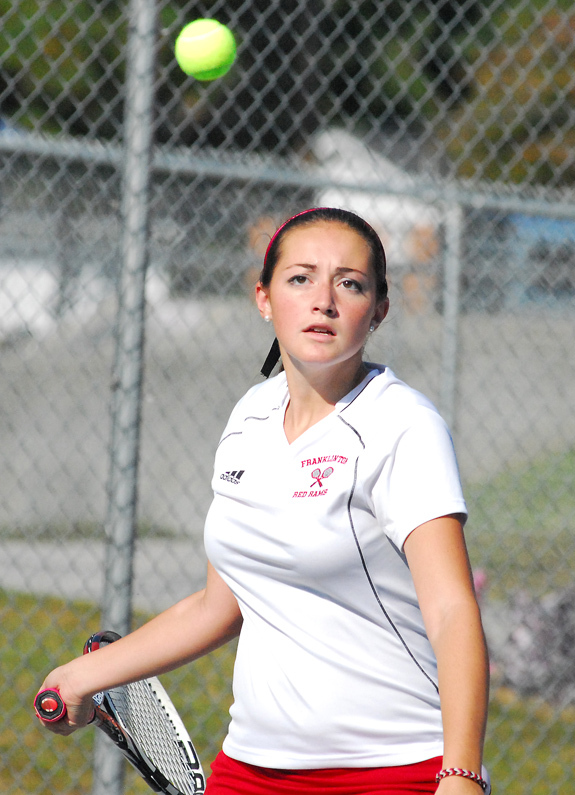 Franklinton’s Madison Poupard prepares to return a forehand as part of Tuesday’s event at Louisburg. 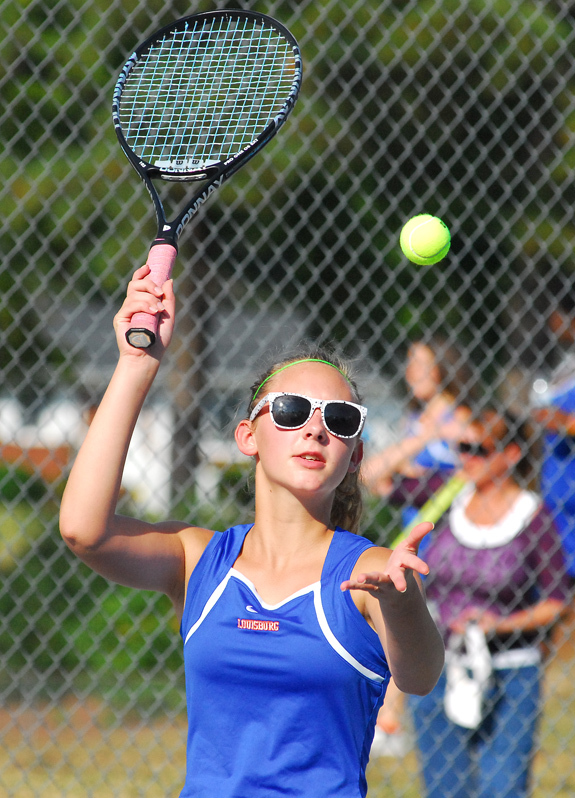 LOUISBURG -- Franklin County’s current queens of the tennis court put their lofty status on the line Monday as the Franklinton Lady Rams traveled to Louisburg for a key non-conference matchup. Franklinton entered the contest with convincing earlier victories over both Louisburg and Bunn -- and the Lady Rams continued their county heroics with a 7-2 conquest at the LHS Courts. FINAL KICK. 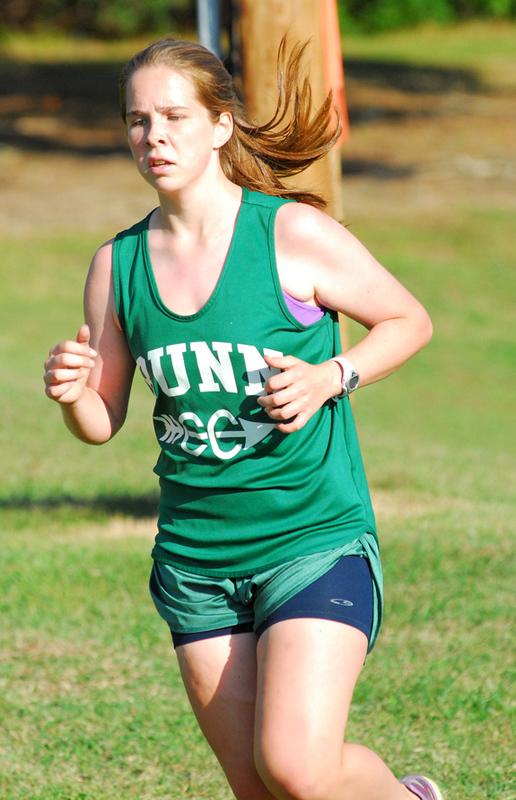 Bunn’s Callie Eatman prepares to cross the finish line during Monday’s Franklin Country Cross Country Meet. LOUISBURG -- A pair of familiar faces crossed the finish line first during Monday’s Franklin County Cross Country Meet at Louisburg High School. Franklinton veteran standout Kayla Wetherell was the girls winner, while FHS teammate Luis Guillen was the boys champion. Southern Vance at Bunn 7:30 p.m.
CONWAY -- Bunn erupted both offensively and defensively in the second half of last Friday’s non-conference football game at Northampton County. LOUISBURG -- The Louisburg College women’s soccer team coasted to a 13-0 win over USC-Lancaster last Saturday afternoon in a Region X conference game on the LC campus. The NJCAA’a leading scorer, Sam Rowland, set the pace as she scored six goals in the conference win, while the country’s second-highest scorer, Jessie Scales also had a good offensive day as she scored five goals. IN CONTROL OF THE SITUATION. 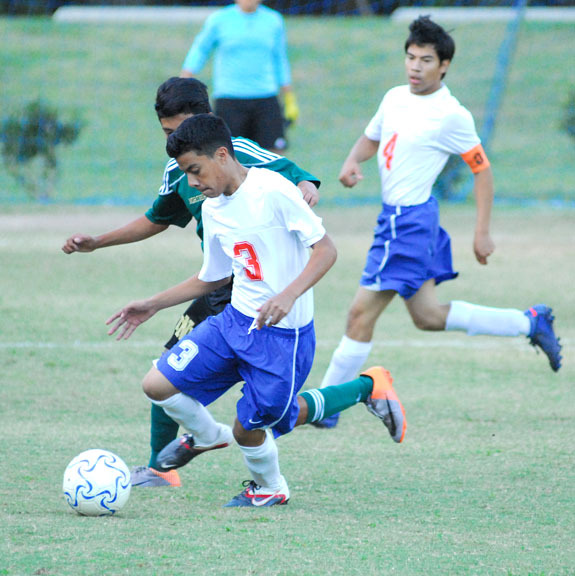 Louisburg High School’s Kevin Rayo dribbles the ball out of harm’s way during last Thursday’s home soccer match with Northern Nash. LOUISBURG -- Regardless of the sport, coaches are always interested to find out how their team responds to adversity. For veteran Northern Nash skipper Joe McCarthy, that opportunity came last week after the Knights suffered a tough overtime loss on Wednesday against Big East Conference rival Wilson Fike. SMITH ON SMITH. Southern Vance’s Sheldon Smith (25) trips up Louisburg’s Derrick Smith (21) during last Friday night’s football contest in Henderson. HENDERSON -- Louisburg couldn’t have asked for a better bounce-back performance during last Friday’s non-conference road football game at Southern Vance. LOUISBURG -- Louisburg’s home volleyball match today against Granville Central will go a long way toward determining the regular season champion in the Tar-Roanoke Athletic Conference. 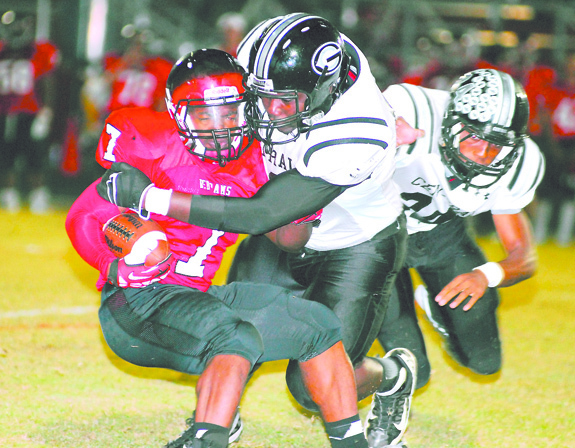 LHS fell to GC on the road earlier in the year and will be looking to take the rematch. To date, that is the Lady Warriors’ lone setback in league action. LOUISBURG -- On the eve of last Saturday’s important Northeast Conference football contest at Dean College, members of the Louisburg College traveling party made the short journey to a fairly famous stadium just down the road from the Dean campus. 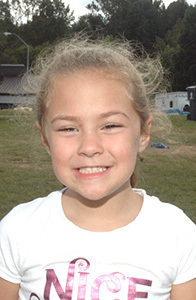 Dean is located in Franklin, Mass. 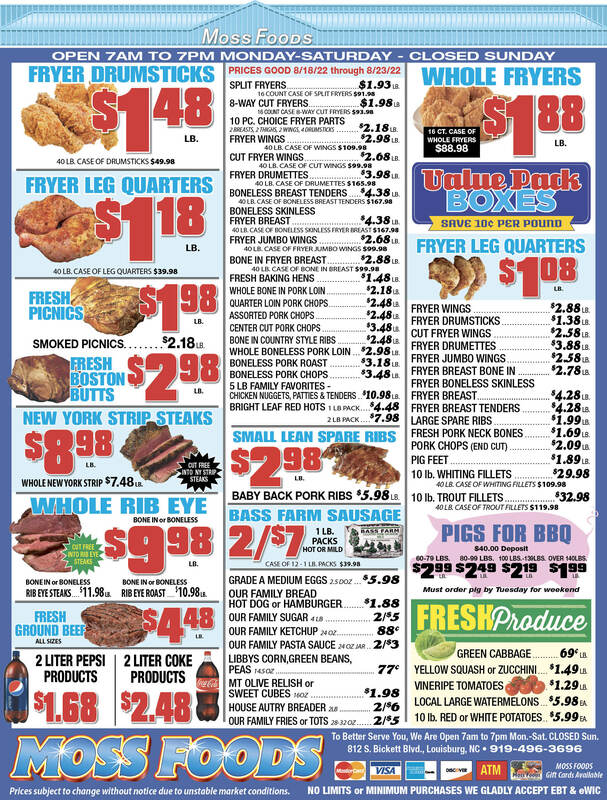 -- just minutes from Gillette Stadium, the home of the New England Patriots. FRANKLINTON -- The Franklinton Recreation Association is currently conducting registration fot its Youth Winter Basketball League. Boys and girls ages 5-13 are welcome. Signups will end on Nov. 9, with regular season action slated to begin on Nov. 16. KINSTON CHAMPS. 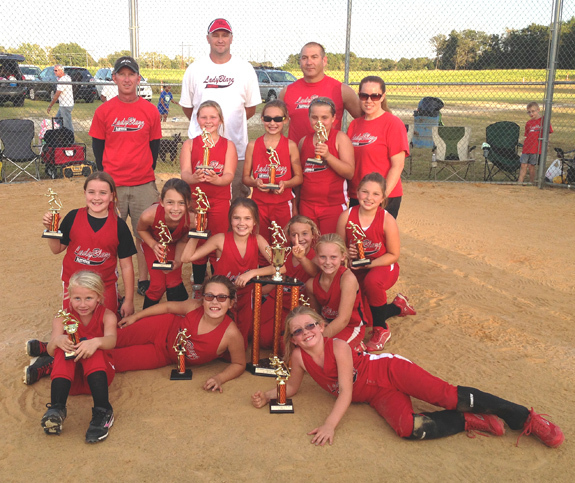 The Carolina Lady Blaze 04 Travel Softball Team took first place at last weekend’s USSSA Queen of the Hill Tournament in Kinston. The Blaze fashioned a perfect 6-0 mark for the tourney. 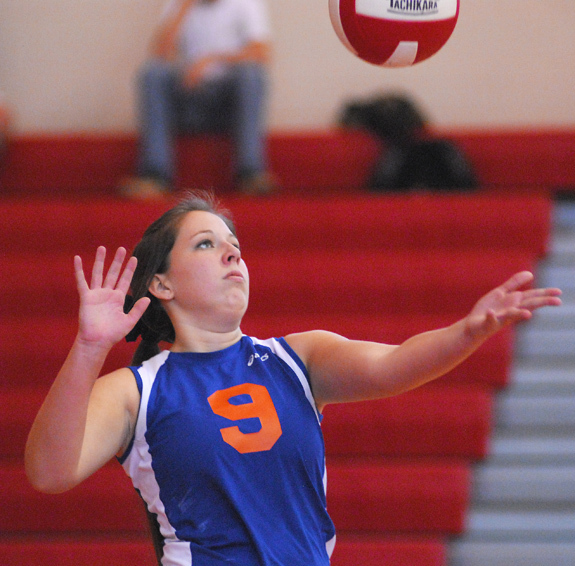 HENDERSON -- The 2013 Vance-Granville Community College women’s volleyball season has started. VGCC, coached by Heather Chance, features former Franklin County standouts Bri Gatson (Bunn) and manager Raquell Jordan (Franklinton) as roster members. 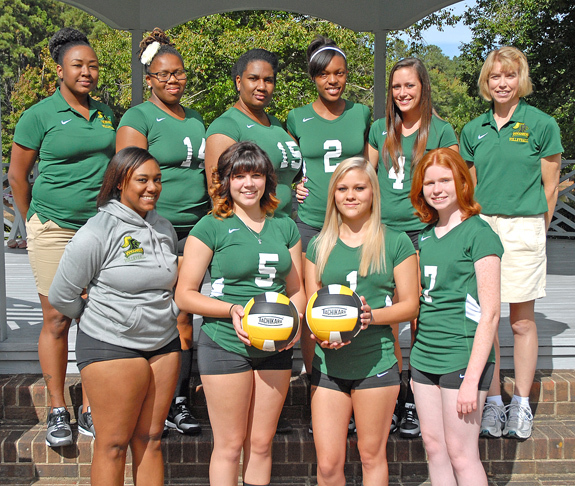 The Vanguards began their season on Sept. 3 by hosting Davidson County Community College at Aycock Recreation Center in Henderson. DANVILLE, VA. -- The Battling Bishop football team of North Carolina Wesleyan College picked up its first win of the seasonl last Saturday afternoon, holding on for a 27-24 victory over Averett University to spoil the Cougars’ homecoming near the banks of the Dan River. 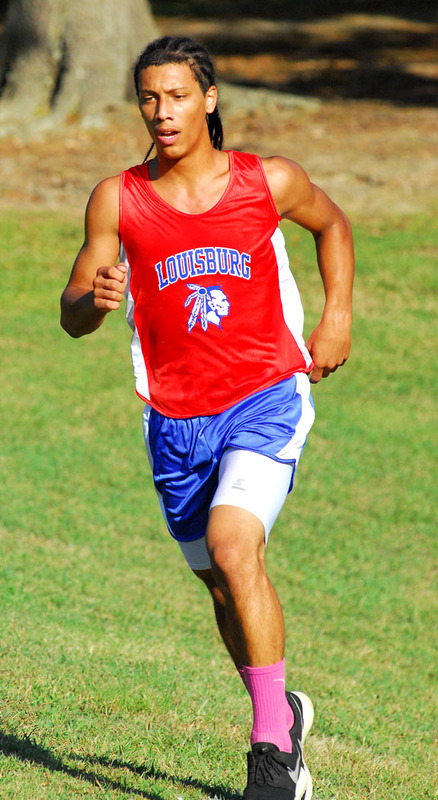 Louisburg’s Chris Thorne finishes up at Monday’s cross country event on the LHS campus. (L to R) Louisburg’s Maximillian Kahn and Northern Nash’s Tyler Jones go after a loose ball last Thursday. 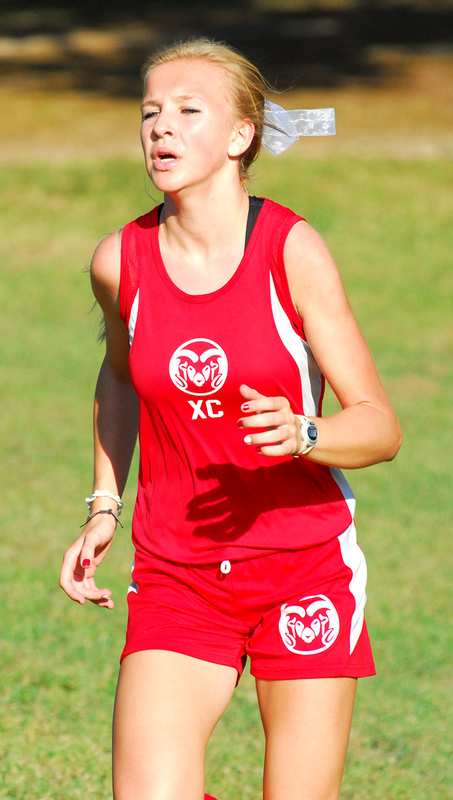 Franklinton’s Kayla Wetherell was the girls champion during Monday afternoon’s Franklin County Cross Country Meet. The event was staged on the campus of Louisburg High School. 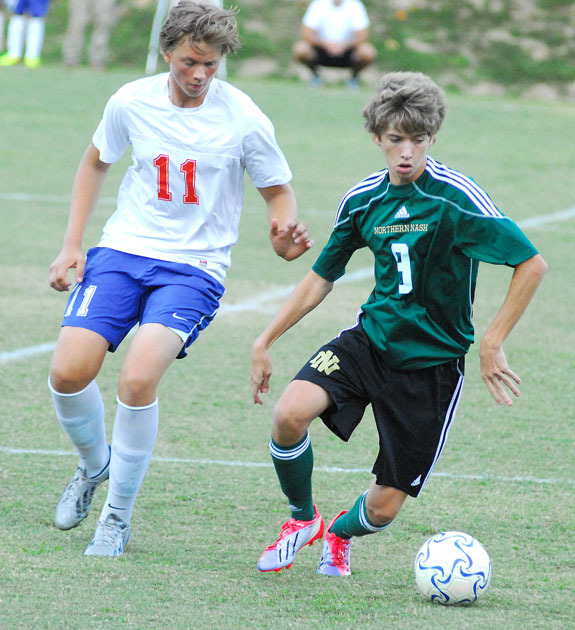 Wetherell, a junior, has been strong this season in Northern Carolina Conference running action. 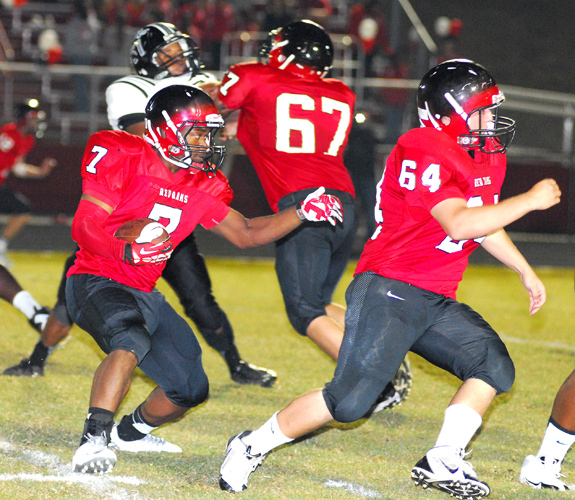 Franklinton’s Derryan Henderson (left) tries to find running room during last Friday night’s home victory against Granville Central High School. Louisburg’s Catie Strickland serves during Tuesday afternoon’s home tennis showdown against Franklinton. Llamas are CUTE, but ALPACAS are absolutely adorable. Their little faces are so unique with precious characteristics. They are all cousins of the camel, and they are great fun to talk to and to feed. If you have never seen an alpaca, or if you have not seen one for a while, you must take a 20-minute ride from Louisburg into the countryside. More than six million young people across the country will be celebrating National 4-H Week, which takes place annually during the first full week of October. Franklin County 4-H leverages National 4-H Week to celebrate the great things that the 4-H youth development program offers young people and highlights the incredible 4-H young people who each day work to make a positive impact on their community. LOUISBURG —Franklin County investigators are still trying to determine what killed a Louisburg High School senior early Monday morning. 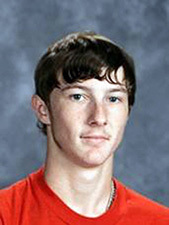 Franklin County sheriff’s deputies were alerted to a case about a missing juvenile at about 6:20 a.m. as the family of Cody Klingensmith was looking for the 17-year-old. A comedy, Harvey, opens in Wake Forest this weekend, about a man who converses with a six-foot-tall rabbit which follows him around but which nobody else can see. Designed by theater company director Bob Baird, the set was built almost entirely by Youngsville resident Tony Womack in his spare time after work. 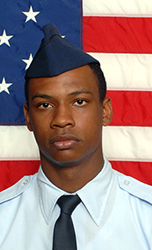 Air Force Airman Rufus D. Hackney graduated from basic military training at Joint Base San Antonio-Lackland, San Antonio, Texas.